After strolling through Korakuen, Hiromi and I walked up to Okayamajo, which was quite a different place in blossom than it was in the driving rain which Lea and I had had to walk through last time I visited the castle. Since Hiromi and I were busy concentrating on the cherry blossoms, I didn’t end up taking many interesting photographs of the castle itself (you can find older photos of the castle here), but I did take several shots around the castle grounds. 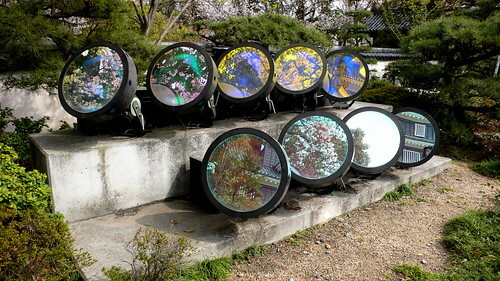 These are the spotlights that illuminate Okayamajo at night. For some reason the coating on the lenses reflects light in a rainbow of colors, kind of like an oil slick in the rain. 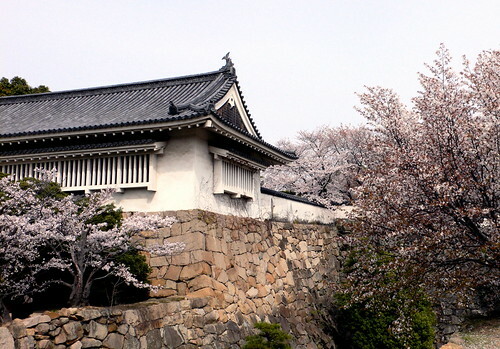 Here’s a view of the reconstructed keep of Okayamajo, accented by blossoming cherry trees. 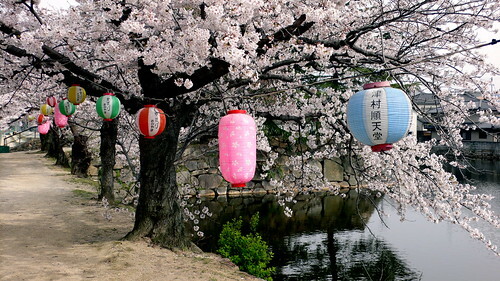 The canal behind the castle was lined with cherry trees and lanterns for night viewing.